There is a beautiful place about 30 kilometers from my residence, named Neelkantheshwar on a hilltop with view of some of the gorgeous valleys of the Western Ghats. There are innumerous statues everywhere. One of them is of Sherawali Mata. 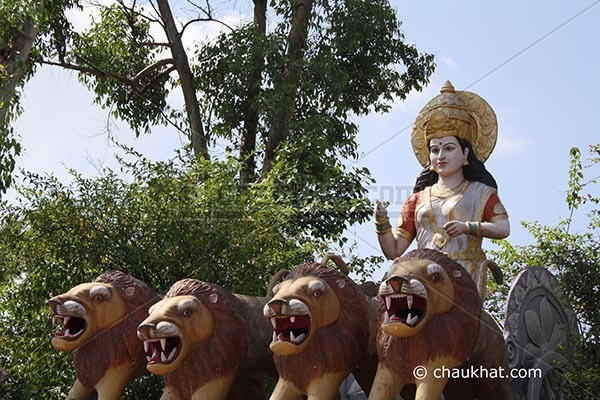 The literal meaning of Sherawali Mata is the goddess with lions. Sher means lion. Sherawali means having lions, in feminine form. Mata means goddess. Sherawali Mata is the goddess with lions. As mentioned in my post named Dagdusheth Ganpati, every god in India has a carrier/vehicle. The carrier or vehicle of Sherawali Mata is lion. I took this photo of Sherawali Mata at Neelkantheshwar. The fact must be that Sherawali Mata is actually Durga, the mother of all goddesses in Indian mythology. If this is true, Sherawali Mata is Parvati, the wife of Shiv, AKA Durga. When evils became a huge threat to the existence of the gods, all gods combined their powers in Parvati to incarnate Durga. There's something mystical about this picture. It draws you towards it! @ Neha: You're so right Neha! Sherawali Mata, indeed, looks regal, with her chariot pulled by lions. This is such a beautiful statue and a great picture of her. I appreciate the information about this goddess. You are acquainting me with so much about India, Bhavesh! I am more synonymous with Durga. However this picture and the name Sherawali Mata appears to be esoteric. And the very moment I see the picture, I had goose bumps all over my body. It is inexplicable. Thanks man. @ cyclopseven: I'm so glad that one of the photographs I have taken is making that great impression! guys im a malaysian can anyone help or guide me abt more info of sherawali matta?pls. @ marcolas88: I hope someone will get back to you. @ Manish Saxena: Thank you for your contribution in this post of Sherawali Mata, and helping marcolas88. Jai mata ki to all devotees. Please worship for others. It has always been observed that when we ask something for ourselves, things may or may not happen but when we pray for somebody else, it is more likely to be heard.